THE brevity of Phillip Walsh’s time at Collingwood should never diminish the impact he made in one breathtaking season, or underestimate what the club lost in its controversial parting from him. Like a comet, Walsh flashed spectacularly, but all-too-briefly in black and white. He played every game of the 1983 season and was considered the league’s best first-year player. Then he was gone with what seemed like indecent haste, swept up in a wave of enmity between two bitter rivals intent on doing as much damage to the other as possible, even if it was to their own detriment. 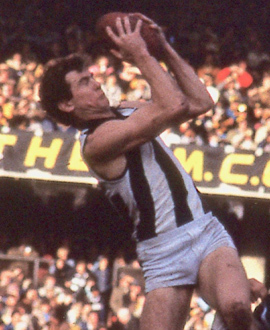 Recruited from Hamilton, Walsh was a largely unheralded, bargain-basement recruit when he came to Victoria Park before the 1983 season, at a time when Collingwood was embarking on the most audacious and expensive recruiting spree in the club’s history. Initially, he was barely noticed against a backdrop of high-priced recruits that included Richmond stars David Cloke and Geoff Raines, as well as interstaters Mike Richardson, Gary Shaw and Greg Phillips. Walsh had played for Hamilton Kangaroos as well as Redan under John Northey, but had come to Collingwood on the recommendation of former Magpie Paul Cranage. Cranage told the Magpies Walsh was a readymade recruit who would “play the first game of the year”. The talented, hard-working left-footer did just that in front of an MCG crowd of more than 72,000 in the Round 1 clash against Melbourne. Walsh’s debut came 11 days after his 23rd birthday, and instantly he looked comfortable at the level, having 20 disposals followed by another 18 against Geelong the following week. Those early games set the scene for a remarkable debut season, where Walsh balanced his ability for winning possessions with his pace and creative flair on the wing. His form was so good that in his fifth game, he took on and beat Hawk Russell Greene, amassing 33 disposals as well as kicking a goal. His impact was such that Hawthorn coach Allan Jeans was forced to switch Greene to the other wing to play on the more seasoned Ricky Barham. Tellingly, as it would turn out, Walsh had 27 disposals in Collingwood’s 48-point win over Richmond in Round 8. The Tigers took note of the wingman wearing the No.41 for the first time. With his form starting to turn heads inside and outside the club, Walsh talked to Lou Richards in an interview with the Sun which gave a hint he was already a deep thinker about the game. Walsh, working as a teacher at Gladstone Park High School at the time, showed he was different to the run-of-the-mill recruits too timid to stay anything for fear of saying something wrong. Incredibly, one of the schoolkids pictured in the photograph with Walsh for the story ahead of the Round 17 game against North Melbourne was a 12-year-old student called Andrew Krakouer. Walsh would be playing against Krakouer’s famous brothers – Jim and Phil – on the Saturday, and young Andrew (uncle of future Magpie Andrew Krakouer) would in time also represent the Kangaroos. Walsh saved his best game for Collingwood against the Tigers in Round 19, the day Kevin Bartlett became the first footballer to reach 400 league games. He had 33 disposals and kicked three goals in a brilliant performance that showcased the very best of his football – speed, balance, grace, great reading of the game, long, long left-foot kicks, a decent leap and a nose for goal. He was the classic wingman, and this was his signature performance in Collingwood colours. But the joy that Magpie fans had that day against the Tigers proved short-lived. The recruiting war between Richmond and Collingwood had already been ugly, but it was about to draw Walsh into it as well. The Magpies thought they had unearthed a star who was going to shine for a decade or more. The Tigers were intent on pinching him. The Agereported years later that Cranage contacted Collingwood at the end of the 1983 season to warn them that Richmond was trying to poach Walsh. On Copeland night, President Ranald Macdonald said: “I will be surprised if Walsh turns up at Richmond.” But that’s precisely what happened, and it came after a legal battle that threatened to drag on for many months before a resolution – albeit a begrudging one – ended with Walsh being cleared to Richmond before the start of the 1984 season. The bright young star was gone within a season. He would go on to play 40 games in three seasons at Richmond before transferring to the Brisbane Bears, where he won the club’s inaugural best and fairest. Again, his time was short-lived there, playing 60 games across four seasons. Walsh would soon start a journey that many saw as his destiny – to be a senior AFL coach – when he was an assistant at several clubs for many years, before being appointed coach of Adelaide in October 2014. In July 2015, only 12 games into his coaching career with the Crows, Walsh was found dead in his home with multiple stab wounds. He was just 55. His son Cy was charged with his murder, but later found not guilty due to mental incompetence. It was an unfathomably tragic end to a life, and a career, that had promised so much. The whole football world was rocked. At Collingwood, we remembered a brilliant young talent who left the club too soon, and a father, husband and coach whose life was ended much too early.